There’s a new face at Showplace Kitchens. 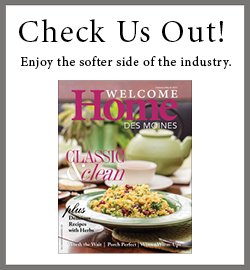 Darius Jackson became the new showroom manager at Showplace Kitchens in Urbandale in July. Contrary to its name, the cabinetry business provides products for kitchen, as well as bath, entertainment, home office, bedroom, and the office. “Our main goal is really just to make sure that we get the word out and educate the community on the benefits and value of Showplace cabinets, and increase our brand recognition,” Jackson says. Jackson has an interior design degree from Iowa State University and most recently worked at Renaissance Granite & Quartz in Urbandale. He has more than 20 years of experience in the design, construction, and home furnishings industries. And he’s eager to utilize his education and experience in his new role. What’s new at Showplace Kitchens and your showroom? One of the things in the showroom we’re working on is updating some of our displays to reflect our newer offerings. Our parent company, Showplace Wood Products, recently launched what we call a “frameless” or “full-access” cabinet line that we nicknamed “EVO,” short for evolution. The line has been available for purchase since early spring. We fully expect to have our first two display updates by year’s end, and we’ll be updating more displays in the first quarter next year. Probably the No. 1 advantage of a frameless cabinet is the increase in space. When you open a traditional cabinet with a frame, the opening is restricted based upon the dimensions of that frame, which protrudes into the opening from the top, sides, and bottom. In a frameless cabinet that’s, say, 36 inches, you have more or less 35 inches of clear access. The full-access is a very contemporary look with clean lines, and I think that look is what’s attracting a younger demographic. It’s not your grandmother’s cabinet. Showplace Kitchens is also making a shift in their sales approach. Can you tell us more about that? Previously, the company relied very heavily on its collective marketing campaigns versus their employees’ individual marketing efforts to reach out to current and potential customers, as well as drive traffic to our showroom. In the past, designers were not necessarily encouraged to do outreach. Moving forward, our parent company has asked that designers adopt more of a sales mindset. I plan to work with each designer and their particular personality and skill set to help them identify the clientele that most reflects their style and level of understanding or engagement, and then determine a marketing path. For instance, I have a designer who has had a lot of experience with the remodeling community. I want to help him engage more with that community, whether it be through networking events, associations, or trade shows. My main focus is to do what I can to support and motivate them to grow their businesses and vis-à-vis grow the business for the company. What will be the biggest challenge in helping designers with their new responsibilities? The biggest challenge is just helping to support and motivate them with this evolution. That includes providing them with the resources that they need, whether that be trainings, seminars, or doing role playing. I have gone out on sales calls with designers to be supportive and sort of model for them what to do. There may be skills they aren’t necessarily familiar with, so you have to help them feel comfortable with those. Any popular trends in cabinetry? The biggest thing we’re seeing in addition to frameless cabinets are colors, and more vivid colors, such as blues. People typically think of a wood grain cabinet, or oak, cherry, maple, or various shades of white. The lead designer for Showplace Wood Products recently took a trip to the Mediterranean—so imagine some of those vibrant colors like you would see on the doors in Greece. What’s driving this trend, I think, is that the world is getting smaller, thanks to Internet technology. It’s allowing people now to have access to images and cultures that 15 or 20 years ago would have been a challenge. The other things that people seem to be responding very well to are the different types of labor-saving or convenience devices, such as two-layered sorters for utensils in drawers or various pull-outs that allow you to more easily access things in the back of your cabinets. The look of these mechanisms today is much less utilitarian, with people paying more attention to the design and style of these accessories. Now they’ve become a part of the overall aesthetic as well. I live in Des Moines with my sons, Devereaux, 17, and Elyas, 14. Most of my time is spent being Dad. But for the last couple years, I’ve also been pursuing a hobby as a voice-over artist for things such as commercials. I’ve done some spots for a local radio station here in town and am looking to expand upon that whenever possible. Back in my college days, I did a lot of theater. Now, being a dad, the time to do those sorts of things is kind of limited. This allows me to exercise that artistic expression without having to be in rehearsals every night.